Angel Hope’s first day of class at Hillside High School, a significant event in any teenager’s life, was supposed to be Aug. 27, 2015. But the day would soon prove to be even more important as she gave birth to her daughter, Gabrielle, at the age of 15. Four first days of school and three birthdays later, Angel is on track to graduate high school. The young mother is ranked fourth in her class, all while balancing the responsibilities of raising her daughter and working 28 hours a week at her part-time job. She plans on attending North Carolina Central University in the fall and study neonatal nursing. For Angel, the perseverance to remain in school while raising her daughter was greater than the 60 percent chance that she would become a high school dropout and the 98 percent chance that she wouldn’t complete college before the age of 30 cited by the National Conference of State Legislatures. Angel wasn’t alone in her fight against the odds. Helping Each Adolescent Reach Their Spark (H.E.A.R.T.S. ), a Durham-based nonprofit dedicated to helping young mothers graduate high school, was by her side every step of the way. With a 100 percent graduation rate and 42 graduates at Hillside and Southern High Schools, the H.E.A.R.T.S. program, now headquartered at ReCity Durham, has a resume as impressive as its members. Tameka Brown, founder and CEO of H.E.A.R.T.S., was first introduced to the difficulties faced by young mothers when her best friend became pregnant at 15. For Angel, that cycle was impossible to ignore. Her mother became pregnant with her at the age of 16, and her father left the family when she was 1-year old. Angel, however, says that everything she does is to break “the generational curse” and provide a better life for her daughter. Including Angel, the eldest of the group, H.E.A.R.T.S. works with 10 young mothers enrolled in Hillside High School—a number that was 16 at the beginning of the year. The nonprofit is hired by individual schools to consult the affected population by organizing programs and workshops around the four H.E.A.R.T.S. keys: self-development, education, family development and financial awareness. The sessions include hands-on learning outside of the classroom with partners like Microsoft Office and Hope Her Way. Semaje Gordon, a 25-year-old student at NCCU and case manager at H.E.A.R.T.S., emphasized that the most important aspect of the organization is the empowerment it inspires among its members. The program expands beyond an emphasis on academic responsibility by encouraging the girls to be proud of who they are and how far they’ve come. According to Gordon, this sense of community provided by both the H.E.A.R.T.S. members and staff is one of the important distinctions between the organization and public social services. Though H.E.A.R.T.S. can help its members apply for day care scholarships and affordable housing, Gordon said the true benefits of the program are gained through a long-term commitment to what H.E.A.R.T.S. stands for. 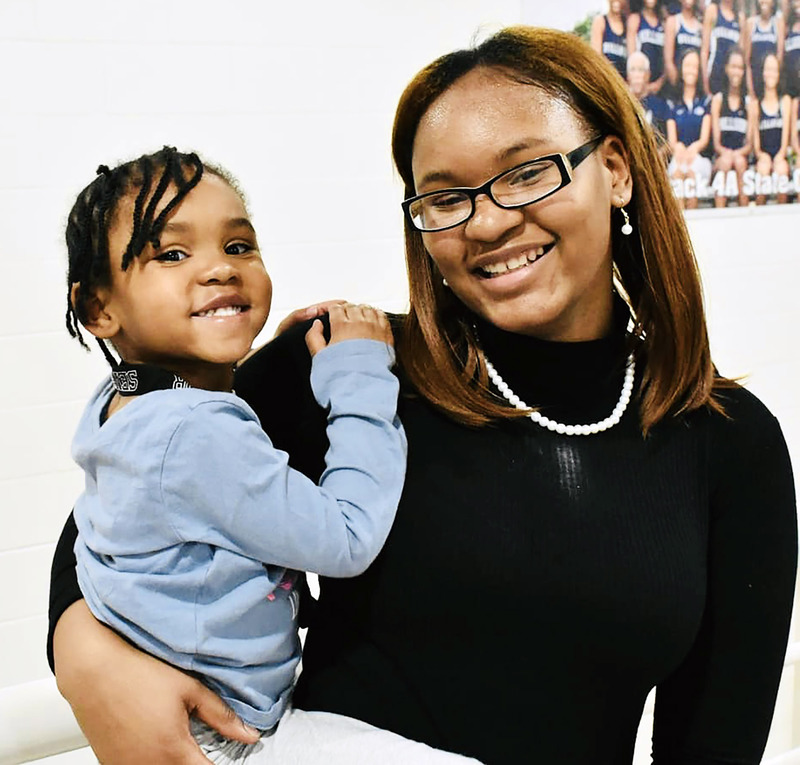 As graduation approaches, Angel continues to work tirelessly to change the statistics surrounding teen motherhood and contribute to a more positive trend. Thanks to programs like H.E.A.R.T.S., Durham Public Schools reported on their website a 0.3 percent decrease in dropout rates for teen parents. With 227 Durham high schoolers citing pregnancy or motherhood as a reason for dropping out during the 2017-2018 school year, it’s easy to dismiss victories such as Angel’s as exceptions. However, according to the State Center for Health Statistics, the total amount of teen pregnancies in Durham County has decreased by 20 percent since 2016 and 62 percent from 1996. Angel is nothing but optimistic. “With every mistake, there’s a lesson. I don’t look at my glass as half empty. I look at it as half full,” she said. She tries to get the other girls to see their situations similarly. “There are a lot of teen moms who don’t want to see that hope because they don’t want to be judged,” Angel said. The moment that lesson clicked for Angel was when she helped deliver a fellow H.E.A.R.T.S. member’s child, an experience she cites as the first time she realized she wanted to be a neonatal nurse. If you want to hear more about Angel’s story and the impact the H.E.A.R.T.S. program has had on her and her daughter’s lives, the non-profit will be releasing an in-depth video testimonial on its website on February 14. Hannah Towey, a UNC-CH sophomore majoring in journalism and global studies, is from Norwalk, Conn. This semester she is serving as a staff writer and teen mentoring coordinator for the Durham VOICE. This entry was posted in 2019, Community-building, Education, Non-profits. Bookmark the permalink.